Bazinga? Photo: Michael Yarish/WARNER BROS.
After millions and millions of dollars and millions of repetitions of “bazinga,” The Big Bang Theory will end after its 12th and final season. CBS announced today that the sitcom, which will return to TV on September 24, will end its run of 279 episodes in May next year. In order for CBS to pick the show up for a 13th season, producer Warner Bros. Television would have had to renew the cast’s contracts. (CBS previously renewed the show for two seasons, when the cast renegotiated their under-a-million-dollar salaries with WBTV). Star Johnny Galecki had previously hinted that this season might be the show’s last, but early this August, CBS claimed it was in “preliminary discussions” to bring everyone back. But it seems they couldn’t get any more Bang for their bucks. Updated, 8/22, 10:05 PM: Entertainment Weekly is reporting that the reason behind the show’s ending is star Jim Parson’s desire to move on. 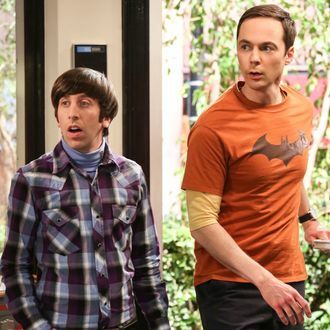 The role of Dr. Sheldon Cooper had netted Parsons four Emmys and one Golden Globe, but the actor is reportedly “ready to say goodbye” to what will be the longest running sitcom in television history when it finishes its 12th and final season.